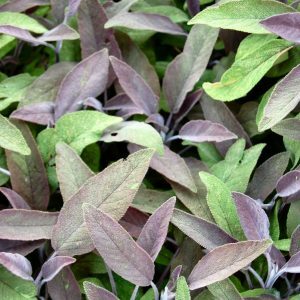 Common sage (Salvia officinalis) is a perennial, evergreen dwarf shrub, which can grow up to 2 feet, and is characterized by woody stems, purple/blue flowers, and grey/green leaves. It is part of the mint family, Lamiaceae and is native to the Mediterranean and the Balkan region (a peninsula and cultural area in South-eastern Europe). The botanical name, Salvia, is derived from the Latin word salvere which means ‘to be saved’. Sage was a sacred ceremonial herb of the Romans, being associated with immortality, and was used by the Greeks as a ‘coronary herb’ because it flushed disease from the body and relieved strain on the heart. In the Middle Ages sage was ingested as a tea to treat colds, fevers, memory and concentration loss, inflammations, ulcers, and many other ailments. Sage is part of the mint family therefore individuals who are allergic to mint may also find that they are allergic to sage. Avoid using this herb during pregnancy and breast feeding as large amounts can be toxic. Certain types of sage are not meant for culinary uses and can be toxic when ingested. 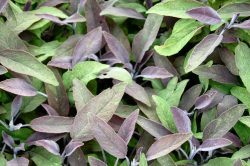 Nontoxic varieties of sage include: Garden sage, Pineapple sage, Russian sage, Golden sage, Berggarten sage, Clary sage, and White sage. Do not use Clary sage when drinking alcohol. Sage may interact with other drugs so consult with a physician before taking it.